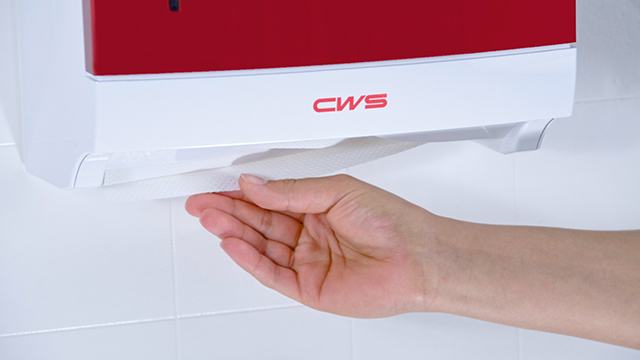 From long-lasting cotton hand towels to folded paper towels, CWS has the perfect towel dispenser for every requirement. Choose the contact-free version for particularly hygienic requirements or dispensers with manual pulling systems. All our towel dispensers are particularly quiet. The disposable paper towels and single-use cotton hand towels dry hands in next to no time. For the great feeling of clean, cared-for hands. Our Paradise Line cotton towel dispensers have been awarded the Blue Angel eco-label. They save resources and avoid waste. This ensures the washroom is always well maintained, clean and sustainable. 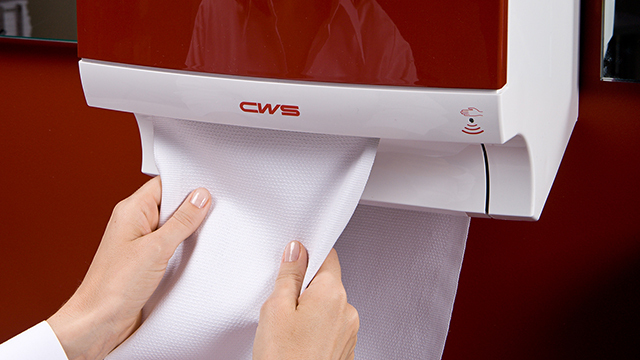 All towel dispensers, whether for textiles or paper, impress with first-class quality and outstanding visual design. In 2009, the dispensers in the popular Paradise Line range won the highly coveted Red Dot Design award.